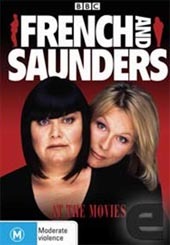 The comedy just keeps on coming with this great DVD showcasing that amazing talents of Jennifer Saunders and Dawn French. Parodies of movies, songs and all manner of things are contained on this disc that is going to have you laughing all the way through. French and Saunders are simply spectacular with most Australians recognising them them from Absolutely Fabulous and The Vicar of Dibley. These two gals are hilarious and have a particular of dry edged humor that will make you belly laugh at some of their antics. This release has the Christmas Special featuring a send up of Star Wars and French stars as Toby Jugs Kenobi! That name alone was enough to make me laugh. The quality of this release is fine, a bit musty looking in some places but for the most part it’s all good. These scenes have been taken over a good period of time and it’s simply reflected in this release. Some of the scenes such as the Gun’s ‘N Roses spoof might be lost on the younger viewers who won’t even know who G’n’R are!!! Highly entertaining and highly recommended, French and Saunders At The Movies is simply a blast to get into. Get out there and get some!